Mon. #2 is HERE. Please follow us on Tumblr or Twitter, subscribe to us on YouTube or like us on Facebook. Don't miss Ian Clark's SmackDown Live Recap at 8 PM ET, The Wrestling Nerdcast tapes at 9 and Nickolye's 205 Live Recap at 10! With the cheap plugs out of the way here's Tuesday's latest wrestling news. The YouTube subpocalypse is for real and my YouTube channel could use your support. I need 1,000 subscribers to survive and it's at 739 subscribers right now, an increase from when the bad news broke, but I still need 261 more. While the revenue generated is small compared to a Game Grumps or a NoDQ it's still very much necessary to keep our operation running. Please subscribe to Mistah MegaManFan and help me out! In this interview Roman Reigns talks about Brock Lesnar being a part timer: "It's killing us. It's killing us. It makes for better storytelling. It would be a better product. It would be a better show. When you have the diamond that everybody's chasing, it gives everybody a GPS of where they are and where they're trying to be. Not only that, it's a driving force for live events. It's a driving force for our Friday, Saturday and Sunday (non-televised events) when we don't have a network special or a pay-per-view. It's important to have that thing hanging up in the locker room in a tiny town in South Dakota on a Friday when people are not motivated. A young talent comes in and says the champ's in here and the title is hanging up. I want that. It motivates people in some many different regards and that's what we need. I'm to the point where I've won a bunch of different championships and the only reason I want that championship is because I haven't won it and I want it on this roster. I want it at our shows. I want it in every town because it's going to make everybody better." 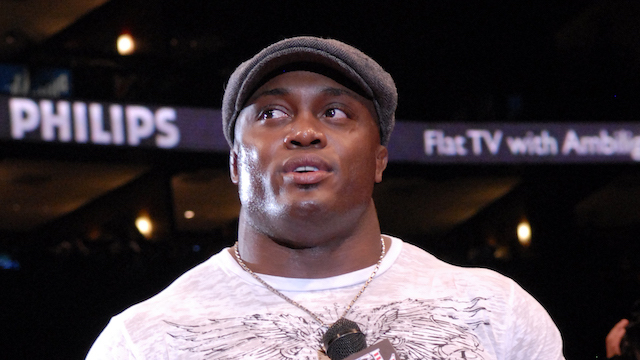 Here Bobby Lashley recalls a SmackDown debut that WASN'T supposed to happen: "The first time when I debuted on Smackdown, I was not supposed to debut. There was nothing going on, I was just one of the OVW guys that were on the road. So they let me go on the road, do a couple house shows and that was it, I was not supposed to be brought up. And then it goes to TV and I was in catering because there was no way I was doing anything and then someone says, 'Hey, you have a match tonight'. Immediately my heart starts racing, I was like, 'Huh? What? What are you talking about?! Me? I'm not supposed to do it!' But then when I went over there I kind of stepped back in the back and you know what? The person that got me was Paul, Paul Heyman. As crazy as this is, he came and talked to me because he mentored me back in OVW when I was in OVW, he was a writer there and he was the one that talked to me and got to know me. He just walked over to me with that smug little grin that he always has on his face and looked at me and goes, 'You nervous?' and I was like, 'Yeah I'm nervous, what are you talking about? There's 17,000 people here! I just started wrestling!' And he goes, 'The only thing you're really nervous about is and the only thing that messes you up is this whole anticipation act. When they call your name, you're going to have to go out and I know you're going to do great and you're going to be excited and you're going to come back and be like, man why did I kill myself before?' he said, 'If you can handle this stuff now, the rest is easy.'" Here's Tessa Blanchard calling her parents after she won Impact's Knockouts Title. Last but not least Impact Wrestling *SPOILERS* are below (WZ) so don't scroll down if you don't want to know. Austin Aries, Killer Kross and Moose come out and Moose cuts a promo on Eddie Edwards, calling him a fraud. Moose says he had Eddie's back when he was injured, but Killer Kross was the only guy checking on him when he was injured. Aries was the one who told Moose he'd never be number one if he pandered to the fans, then Johnny Impact come out and said he thought Kross was more ambitious than being a bodyguard. Aries and Impact is set for Bound For Glory, then the two brawl on the ramp. Moose and Kross take Impact out, then Aries hits him in the throat with a chair. – Grado was pinned, then Katarina called him an embarrassment and said she doesn't love him. She tried to kiss Hendry but he said it's only plutonic, so she slapped him and left. * oVe defeated Zachary Wentz, Ace Austin and Trey Miguel. Sami pinned Ace after the Crists hit a Doomsday Cutter. Austin Aries, Moose and Killer Kross come out for a sitdown interview in the ring. Aries says Johnny Impact and Eddie Edwards won't be back for a long time. KM and Fallah Bahh come out and Aries offers Fallah a banana, and KM calls him a liar. KM says Aries is a terrible world champion, and Aries offers him a title shot.